Ramsden, Peter G.. "Haudenosaunee (Iroquois)". The Canadian Encyclopedia, 16 October 2018, Historica Canada. https://www.thecanadianencyclopedia.ca/en/article/iroquois. Accessed 18 April 2019. The Haudenosaunee, or “people of the longhouse,” commonly referred to as Iroquois or Six Nations, are members of a confederacy of Aboriginal nations known as the Haudenosaunee Confederacy. 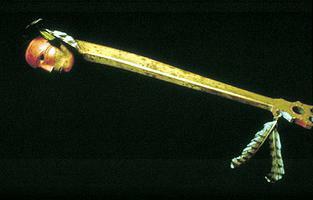 Iroquois war club, around 1847-1854 (courtesy Glenbow Museum/National Museums of Scotland collection). 1860s (photographer unknown, courtesy Library and Archives Canada/C-84932). 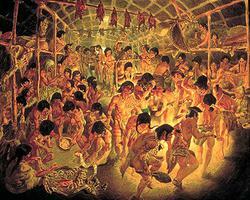 Activities at an Iroquoian longhouse feast include dancers, gamblers, storytellers (courtesy Lazare and Parker). 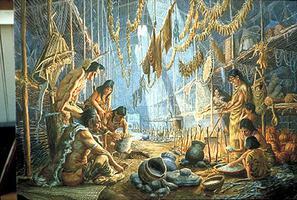 Iroquoian Longhouse interior (artwork by Lewis Parker). The Haudenosaunee, or “people of the longhouse,” commonly referred to as Iroquois or Six Nations, are members of a confederacy of Aboriginal nations known as the Haudenosaunee Confederacy. Originally a confederacy of five nations inhabiting the northern part of New York state, the Haudenosaunee consisted of the Seneca, Cayuga, Oneida, Onondaga and Mohawk. When the Tuscarora joined the confederacy early in the 18th century, it became known as the Six Nations. Today, Haudenosaunee live on well-populated reserves — known as reservations in the United States — as well as in off-reserve communities. The five nations of the Haudenosaunee Confederacy — also known as the Iroquois League or League of the Five Nations — occupied an area from the Genesee River on the west, through the Finger Lakes regions, to the Hudson River on the east in what is known as the Eastern Woodlands cultural area. The linguistically related Tuscarora moved north from North Carolina and Virginia to join the confederacy in 1722. Though technically the sixth nation of the confederacy, the Tuscarora — along with other represented nations like the Delaware, Wyandot and Tutelo — present their issues to the confederacy through the Cayuga nation. The confederacy is united by the Great Law of Peace (Kaianere'ko:wa), which is considered both a political constitution and a basis for Haudenosaunee society in general. The Great Law was given to Hiawatha by the prophet Peacemaker, and together they helped to form the confederacy. The Haudenosaunee use the metaphor of the longhouse to describe their political alliance, and its spirit of togetherness also applies to social and cultural life, mirroring the use of the Great Law of Peace as both a political and cultural document. Members of individual nations within the confederacy may live off-reserve or in reserve communities in Canada and the United States. Six Nations of the Grand River is a reserve outside of Brantford, Ontario, where all six members of the Haudenosaunee are represented. 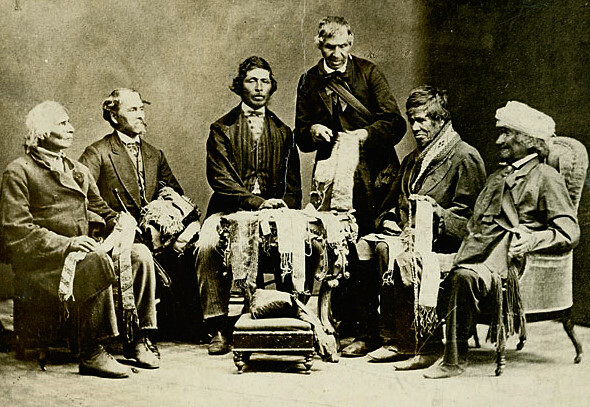 In 1924, the federal government imposed an elected council structure under the Indian Act; however, the traditional council model continues to function in opposition to this model. The Haudenosaunee Grand Council of Chiefs continues to meet and direct national Haudenosaunee policies. The languages of the Haudenosaunee are part of the Iroquoian language family and were linguistically related to the languages of neighbouring nations in the Great Lakes area — such as the Huron-Wendat, Petun and Neutral, which are now extinct — and to more distant communities including the Cherokee and Tuscarora. There are also suggestions of ancient relationships to the Siouan and Caddoan language families of the Great Plains. In the 2011 National Household Survey, Statistics Canada enumerated 2,420 Iroquoian-language speakers, including 1,485 Mohawk-speakers, 720 Cayuga-speakers and 235 Oneida-speakers. Almost all speakers are located in Ontario, with just over 100 living in Québec. Though assimilative policies (see Aboriginal-European Relations; Residential Schools) have largely eroded the use of Iroquoian languages, many Haudenosaunee-led education initiatives are reviving traditional languages. Before sustained contact with Europeans, the Haudenosaunee were horticulturalists, living year-round in stockaded villages of several hundred people. Social structure was based on matrilineal principles; the basic unit was matrilineal, consisting of the descendants of an individual woman. Female members lived together with their husbands (who belonged to other matrilineages) in a single longhouse; a village would contain anywhere from a few small longhouses to as many as 50. Several matrilineages formed the matrilineal clan which, besides being of symbolic and ceremonial importance, served to regulate marriage patterns. Marriage was forbidden between members of a clan. For the most part these clans bore animal names like Bear, Wolf, Turtle, Snipe, Deer or Hawk, and members of a clan were considered family despite national allegiance. The league was governed by a council of 50 sachems (supreme chiefs) representing each clan and nation, with each of the five founding members of the confederacy represented by a delegation of eight to 14 members. Each of these positions was hereditary within a matrilineage. The individual communities and villages were governed by councils of their own sachems and chiefs. Clan Mothers representing each nation’s clans were entrusted with particular responsibilities. Clan Mothers oversaw the actions of the chief, and appointed a new one on his death. Many Haudenosaunee people still follow traditional systems and will thus identify themselves by their clan and nation, and look to the chiefs, and the Clan Mothers who chose them, for guidance. Archeological evidence places Haudenosaunee in the area around present-day New York state by approximately 500 to 600 CE, and possibly as far back as 4000 BCE. Their distinctive culture seems to have developed by about 1000 CE. Estimates vary widely as to the founding date of the Haudenosaunee Confederacy, with many claiming a date in the mid-16th century. However, in 1997, researchers Barbara A. Mann and Jerry L. Fields proposed a founding date of 31 August 1142. They arrived at this by consulting the full oral tradition, archaeology, historical record, and even astronomical and actuarial calculations. With the coming of the fur trade in the 16th century, the Haudenosaunee embarked on successful campaigns to subjugate or disperse neighbouring groups. The French-allied Huron-Wendat were dispersed from their homeland after several villages were destroyed in 1649 and multiple individuals were adopted into the Haudenosaunee. These dispersal campaigns would also impact the Petun, Neutral and Erie in the following decade. The French maintained trading and military alliances with many of the enemies of the Iroquois; thus, Haudenosaunee and New France were often at war (see Iroquois Wars). During periods of peace some Haudenosaunee were converted to Catholicism and were persuaded to settle along the St Lawrence. The Haudenosaunee remained firmly tied to trading interests in Albany, New York. Rivalry between New France and the Dutch and English at Albany precluded a lasting peace between the French and the Haudenosaunee. The Haudenosaunee frequently raided French settlements on the St Lawrence and, in 1660 at the Long Sault, and in 1689 at Lachine, Québec, sent large armies to attack the colony. France attacked Haudenosaunee towns in 1666, 1687, 1693 and 1696. European colonists and Haudenosaunee had established an alliance of mutual non-interference in the early 17th century with the Two Row Wampum. The Silver Covenant Chain was another agreement between nations, the British Crown and the Haudenosaunee. With the Treaty of Albany in 1701, Haudenosaunee sold the lands of the Great Lakes to Britain in return for protection and continued hunting and fishing rights. Later the same year in Montréal, Haudenosaunee signed a treaty with the French, ensuring peace among Indigenous nations and further protection. Population losses owing to both disease and war had been considerable, even though the Haudenosaunee had absorbed large numbers of war captives and refugees. Despite official neutrality, the Mohawk, under the influence of Sir William Johnson, did, on occasion, take the field as English allies; and the Seneca at times fought beside French armies, as at the defeat of General Braddock in 1755. Except for the Oneida, who fought for the American cause, the Haudenosaunee supported the Loyalists and British in the American Revolution, joining that conflict in 1777. The Mohawk lost their homes to neighbouring rebel settlers, and many Seneca, Onondaga and Cayuga towns were burned in 1779. The Haudenosaunee and their allies, under the leadership of Joseph Brant and others, repeatedly attacked and burned American forts and settlements. After the war, many followed Brant to settle on a land grant secured for them by Governor Frederick Haldimand on the Grand River, a truncated version of which is now the Six Nations of the Grand River reserve. Others settled on the Bay of Quinte. As they did in the American Revolution, Haudenosaunee warriors fought on both sides of the War of 1812, disrupting the Great Law of Peace. Joseph Brant’s son, John Brant, fought in the conflict and went on to become the first Aboriginal person elected to the Upper Canada legislative assembly in 1830, though his eligibility was questioned and his seat lost. Continued implementation of assimilative policies by the government of Canada eroded the cultural and political base of the Haudenosaunee throughout the 19th and 20th centuries, but opposition and activism has maintained strong cultural and political communities. One example is the interpretation of the Jay Treaty of 1794. 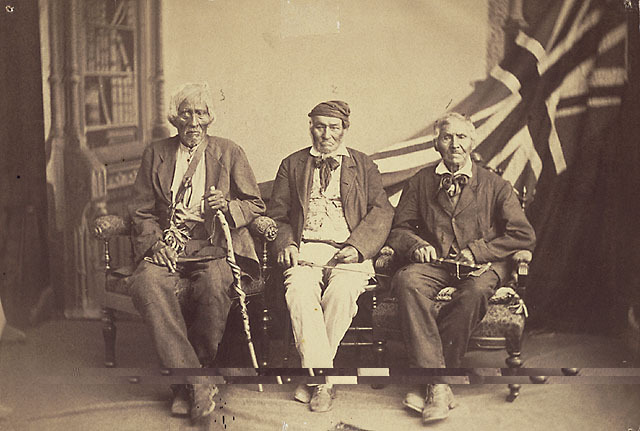 The treaty, which defined the border between Canada and the United States, recognized and upheld the rights of all Aboriginal peoples to cross the border freely for work or residence. 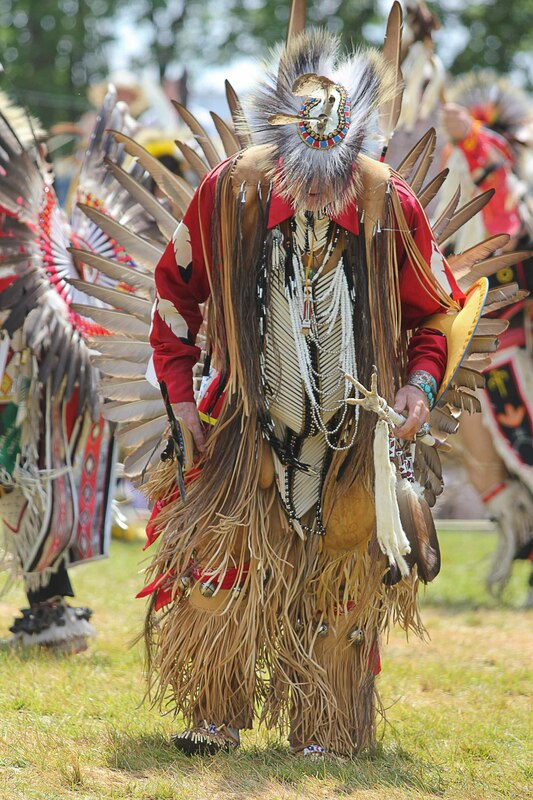 Mohawks of Akwesasne, whose lands straddle the international border around Cornwall, Ontario, protested when Canadian officials failed to uphold this provision in 1968. The border debate escalated, centring on the ability of an individual to transport goods across the border without paying duty or customs. In 1988, Grand Chief Michael Mitchell crossed the border, declared goods, but stated he would not pay duty. After being presented with a claim for unpaid duty, the case was presented to the Federal Court, which held that according to Section 35 of the Constitution Act, Mitchell, and all Aboriginal peoples, had Aboriginal rights to bring goods from the United States into Canada. The Supreme Court overturned the decision on appeal in 2001, asserting that Mitchell had not proven that the right to bring goods across international borders for the purpose of trade with Aboriginal nations north of the St Lawrence River predated the assertion of Canadian sovereignty, which was necessary to claim Aboriginal rights. Haudenosaunee communities like Six Nations, Akwesasne (Mohawk) and Kahnawake (Mohawk) outside of Montréal are among the largest and most populous reserves in Canada. In 2005, Six Nations enumerated total band membership as 22,294, with 11,297 living in the community. Akwesasne has approximately 11,000 residents, while in 2007 Kahnawake had approximately 10,000. See also Aboriginal Peoples: Eastern Woodlands and general articles under Aboriginal Peoples. L.H. Morgan, League of the Ho-dé-no-sau-nee or Iroquois (1861, repr League of the Iroquois, 1962); A.A. Shimony, Conservatism among the Iroquois at the Six Nations Reserve (1961); B.G. Trigger, ed, Handbook of North American Indians, vol 15: Northeast (1978). Extensive site devoted to current and historical issues of importance to the Six Nations community. A Heritage Minute about the Iroquois legend of the great Peacemmaker, who created the confederacy known as the League of the Six Nations. From Historica Canada. See also related learning resources. Le Gardien de la PaixUne Minute du patrimoine de la légende de la grande Peacemmaker, qui a créé la Ligue des Six Nations. Voir aussi liées les ressources d'apprentissage.